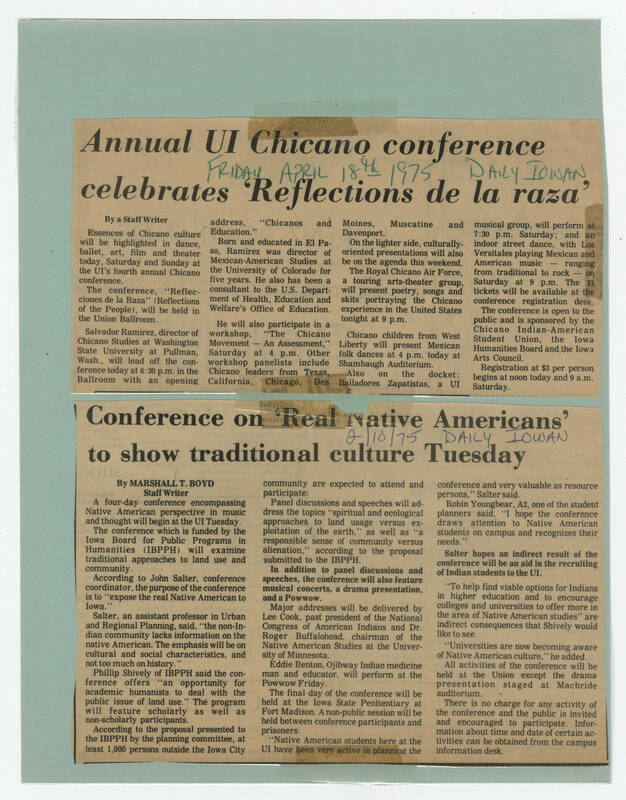 Annual UI Chicano conference celebrates 'Reflections de la raza' [[Handwriting]] FRIDAY APRIL 18th 1975 DAILY IOWAN [[bold]] by a Staff Writer [[end bold]] Essences of Chicano culture will be highlighted in dance, ballet, art, film and theater today, Saturday and Sunday at the UI's fourth annual Chicano conference. The conference, "Reflectiones de la Raza" (Reflections of the People), will be held in the Union Ballroom. Salvador Ramirez, director of Chicano Studies at Washington State University at Pullman Wash., will lead off the conference today at 6:30 p.m. in the Ballroom with an opening address, "Chicanos and Education." Born and educated in El Aso, Ramirez was director of Mexican-American Studies at the University of Colorado for five years. He also has been a consultant to the U.S. Department of Health, Education and Welfare's Office of Education. He will also participate in a workshop, "The Chicano Movement -- An Assessment," Saturday at 4 p.m. Other workshop panelists include Chicano leaders from Texas, California, Chicago, Des Moines, Muscatine and Davenport. On the lighter side, culturally-oriented presentations will also be on the agenda this weekend. The Royal Chicano Air Force, a touring arts-theater group, will present poetry, songs and skits portraying the Chicano experience in the United States tonight at 9 p.m. Chicano children from West Liberty will present Mexican folk dances at 4 p.m. today at Shambaugh Auditorium. Also on the docket: Bailadores Zapatistas, a UI musical group, will perform at 7:30 p.m. Saturday; and an indoor street dance with Los Versitales playing Mexican and American music -- ranging from traditional to rock -- on Saturday at 9 p.m. The $1 tickets will be available at the conference registration desk. The conference is open to the public and is sponsored by the Chicano Indian-American Student Union, the Iowa Humanities Board and the Iowa Arts Council. Registration at $3 per person begins at noon today and 9 a.m. Saturday. Conference on 'Real Native Americans' to show traditional culture Tuesday [[Handwriting]] 2/10/75 DAILY IOWAN [[bold]]by MARSHALL T. BOYD Staff Writer [[end bold]] [[Article text]] A four-day conference encompassing Native American perspective in music and thought will begin at the UI Tuesday. The conference which is funded by the Iowa Board for Public Programs in Humanities (IBPPH) will examine traditional approaches to land use and community. According to John Salter, conference coordinator, the purpose of the conference is to "expose the real Native American to Iowa." Salter, an assistant professor in Urban and Regional Planning, said, "the non-Indian community lacks information on the native American. The emphasis will be on cultural and social characteristics, and not too much on history." Phillip Shively of IBPPH said the conference offers "an opportunity for academic humanists to deal with the public issue of land use." The program will feature scholarly as well as non-scholarly participants. According to the proposal presented to the IBPPH by the planning committee, at least 1,000 persons outside the Iowa City community are expected to attend and participate. Panel discussions and speeches will address the topics "spiritual and ecological approaches to land usage versus exploitation of the earth," as well as "a responsible sense of community versus alienation," according to the proposal submitted to IBPPH. [[bold]]In addition to panel discussions and speeches, the conference will also feature musical concerts, a drama presentation and a Powwow. [[end bold]] Major addresses will be delivered by Lee Cook, past president of the National Congress of American Indians and Dr. Roger Buffalohead, chairman of the Native American Studies at the University of Minnesota. Eddie Benton, Ojibway Indian medicine man and educator, will perform at the Powwow Friday. The final day of the conference will be held at the Iowa state Penitentiary at Fort Madison. A non-public session will be held between conference participants and prisoners. "Native American students here at the UI have been very active in planning the conference and very valuable as resource persons," Salter said. Robin Youngbear, A2, one of the student planners said, "I hope the conference draws attention to Native American students on campus and recognizes their needs." [[bold]]Salter hopes an indirect result of the conference will be an aid in the recruiting of Indian students to the UI. [[end bold]] "To help find viable options for Indians in higher education and to encourage colleges and universities to offer more in the area of Native American studies" are indirect consequences that Shively would like to see. "Universities are now becoming aware of Native American culture," he added. All activities of the conference will be held at the Union except the drama presentation staged at Macbride auditorium. There is no charge for any activity of the conference and the public is invited and encouraged to participate. Information about time and date of certain activities can be obtained from the campus information desk.